Sakai Guides and DocumentationSakai Complete User Guide Tests and QuizzesHow do I import a question pool? Click the Choose File button to browse for and select the import file on your computer. Once you have selected your file, the file name will be displayed. 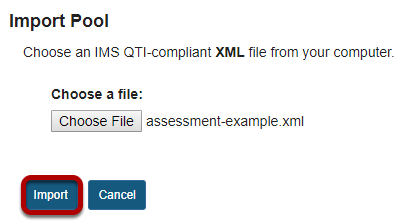 Note: Your import file must be an IMS QTI-compliant XML file. The Import Pool option does not accept zip files. Zoom: The question pool is imported to the site. 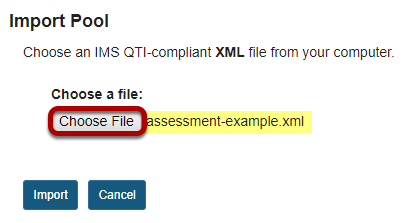 Prev: How do I import and export assessments? Next: How do I share a question pool?